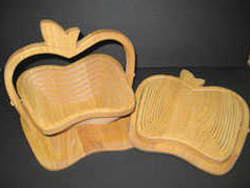 Apple shaped Amish oak folding baskets. Hand made locally by Amish! The size is about 11"X11"
Heart shaped Amish oak folding baskets. Hand made locally by Amish! The size is about 11"X11"
Lotus shaped Amish oak folding baskets. Hand made locally by Amish! The size is about 11"X11"
© 2014 - 2019 Old Country Cheese, All rights reserved.